Kieran Tierney has confirmed himself as a major doubt for Scotland’s Euro 2020 qualifying double-header in June. He travelled to Kazakhstan with Alex McLeish’s squad last month before admitting defeat in his efforts to overcome a calf issue. Now Tierney fears his body will not be in the peak condition required to give Scotland his best for the home tie against Cyprus then a big test in Belgium. That is because the Celtic star requires an extended period of rest to clear up the pelvic problem that has disrupted his season since mid-December. 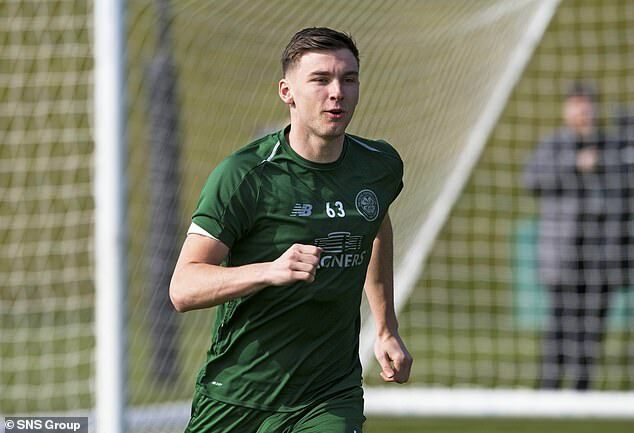 When quizzed on the timescale for a full recovery, Tierney said: ‘It will be until I get a proper rest. It will take a few weeks of doing nothing to recover the body fully. ‘It is my pubis bone – and it is just through overuse; the intensity of our games and training, the number of games. It has been non-stop for me since I was 17 – it has just caught up. ‘But it is nothing too serious. I’m playing, I’m training and I’m getting through it fine. ‘After the games, it will feel a bit stiff but that’s expected. Lots of people who have had it have told me I’ll be fresh when I’ve had a break. ‘It’s not just the pubis bone, you need to recover your legs as well. And at Celtic, you come straight back into the Champions League qualifiers, so we all need the break. ‘For my career, 100 per cent, it would benefit me to rest. But it’s up to Scotland and Celtic to talk about that. ‘I’m not here saying I want to pull out. But I do want what’s best for the country and, if I go there and I’m not completely fit, that won’t be the case. ‘If I go and I’m ready, then it is what it is. But our physio Tim Williamson does both (Celtic and Scotland) and he will know what’s best for everyone.. You need to look after yourself and, if I can’t go there 100-per-cent fit, what’s the point? 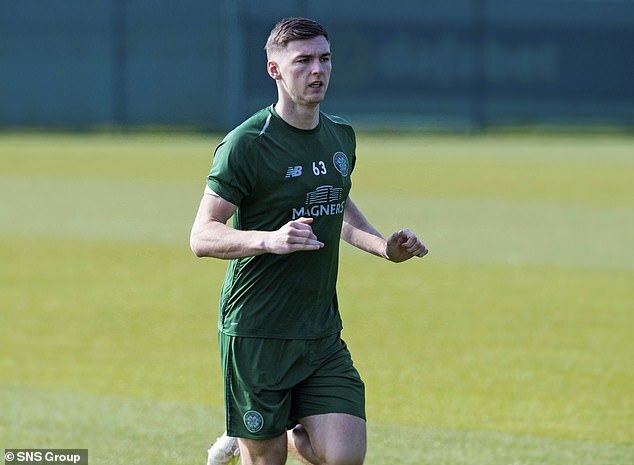 ‘As it stands just now, I’m fine.’ After limping off late in the recent victory over Rangers, Tierney returned to manage 90 minutes against Livingston and has declared himself ready to face Aberdeen in the Scottish Cup semi-final at the national stadium today. Interim manager Neil Lennon says a longer period on the sidelines will be key to Tierney returning primed for next season. ‘Eventually KT will have to have a rest,’ stressed Lennon. ‘He can’t keep going with just a couple of weeks off in the summer then back into it. ‘He’s playing high-level, high-intensity professional football week-in, week-out, and it is going to take its toll on a young, developing body.